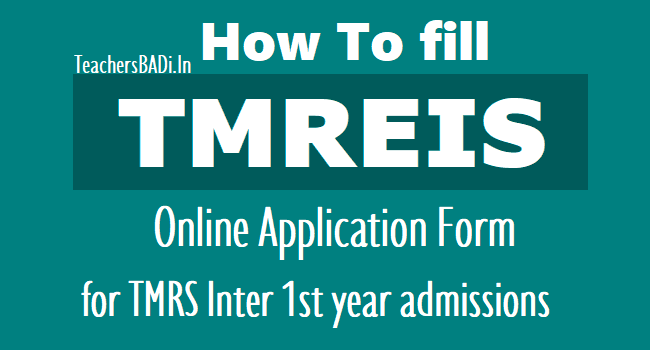 How to fill TMREIS Online Application form for TMRJC Inter 1st year admissions, How to apply for TMREIS Inter first year admissions 2019, Online applying procedure for TMRJC Inter 1st year admissions 2019,TMR Junior Colleges Inter 1st year Admissions Online application form 2019, TS Minority Welfare Residential Junior Colleges Admissions, TS Minority Welfare RJC Inter 1st year admissions 2019. TMR Junior Colleges Inter 1st year Admissions 2019 (TMREIS TS Minority Welfare). Online Applications are invited through TMREIS Official website tmreis.telangana.gov.in from the eligible candidates from Minorities (Muslims, Christians, Parsis, Jains, Sikhs& Buddhists) and Non- Minorities (SCs, STs, BCs & OCs) Communities for Fresh Admissions into IntermediateFirst Year in TMR Colleges of Telangana State. 1. At the time of submission of ONLINE application the candidate should possess the following. c) Memorandum of marks of SSC/X Class Board Exam. Obtained through E-seva/Mee-seva or original marks sheet issued by the Board. c) After fulfilling the eligibility submit the duly filled in ONLINE application through the official website tmreis.telangana.gov.in from any internet centre or any upgraded TMR Institution as shown in annexure II. d) There is no ONLINE registration fee. For all other details candidates should visit the official website tmreis.telangana.gov.inor contact helpline centre (040-23437909) any upgraded TMR Institution, concerned DMWO office or TMREIS Head office, Near Star Hospital, Road No. 10, Banjara Hills, Hyderabad. h) Application can be submitted through ONLINE up to ..-05-2019.
i) Boys have to apply for admission in Boys’ Colleges and Girls have to apply for admission in girls’ colleges only. l) The candidates who opt BiPC group should have been secured minimum marks of 60% or CGPA 6.0 and B2 grade in Science subject in SSC/X Class Board Examination. n) The candidates who opt CEC group should have been securedminimum marks of 60% and CGPA 6.0 in SSC/X class Board Examination. o) The candidate may optany one of four groups i.e. MPC, /BPCor MEC/ CEC subject to his/her eligibility. However he/she can give order of preference of these four groups for admission as per his/her choice.